Job openings at marine parks and aquariums are usually quickly filled due to the high level of interest in such positions. It is common for these organizations to receive dozens of applications for a single job posting. Job seekers should focus on gaining practical experience and relevant education to add depth to their resume, as competition is keen for any opening related to this field. The first step to getting a job at a marine facility is determining what career path you are interested in pursuing. Marine facility career options include a marine biologist, marine mammal trainer, aquarist, ichthyologist, veterinarian, veterinary technician, and various support staff positions in animal care or administration. If you decide what career you are seeking at an early stage, you will have the ability to tailor your college courses to prepare you for that specific job. It is important to do some research on the career that you intend to pursue. You can research positions on the internet, in published career guide books, or in industry periodicals. It is also a good idea to set up a meeting with someone who holds the position at a local marine facility (if there is one within driving distance) or attempt to get in contact with a person in the position via email. They may be able to give you valuable practical advice on entering the field. A marine facility’s media department may be able to facilitate this if an individual’s contact information is not posted online. The minimum level of education required for a particular marine position usually varies from a two-year degree to a four-year degree. Some career paths (especially those in research) require graduate studies at the Masters or Ph.D. level. Individuals seeking a career in the marine sciences often major in a field such as zoology, marine biology, animal behavior, animal science, or another related area. Marine internships are a great way to gain experience in the field while completing your undergraduate or graduate level studies. Many marine research organizations offer summer internship programs for aspiring marine scientists, and some opportunities also have compensation (stipend, housing, or other perks). 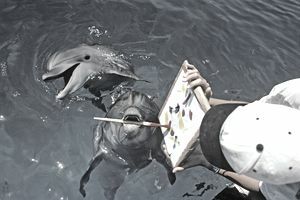 Opportunities may be available with a variety of species including marine mammals, turtles, fish, and other marine life. These internships often also count for college credit, so be sure to check with your advisor to see if they can be counted towards your degree requirements. Internships are also a great way to gain hands-on experience at an aquarium, zoo, research facility, or marine park. Many zoos and aquariums have internship programs designed to allow members of the community to prepare food, assist with feeding, assist with educational programs, observe or assist with veterinary care, and maintain habitats. While many of these opportunities are volunteer positions, some facilities do have some entry-level paid positions. Always remember that showing initiative in unpaid volunteer positions may be the best way to position you for future paid opportunities. Gaining experience as a veterinary assistant (no degree required) is another great way to strengthen your resume for a variety of animal career paths. Assisting a vet who deals with wildlife species is, of course, ​ideal, but working for any type of vet will be a plus for the “experience” category of your resume. This experience will be particularly valuable if you eventually decide to pursue a degree to become a licensed veterinary technician. Marine jobs may be advertised in local newspapers, trade publications, or career email listings sent out by colleges or universities. Opportunities may also be found through a search of the Association of Zoos & Aquariums (AZA) job site which lists available jobs throughout the U.S. You can also search the websites of major aquariums, marine parks, zoos, and research organizations to find additional opportunities. Even if there is not a position advertised, it never hurts to pay a visit to the human resources department to fill out a job application and submit a resume. Be sure to sign up for any available volunteer or internship opportunities, as this can be a great way to make an impression and network with the people who could hire you for a paid position in the future. Your college or university may also have some pull with some of these organizations, so be sure to speak with your advisors about any assistance they may be able to offer on your behalf.